While the financial sector has been buzzing with news about cryptocurrencies like the well-known Bitcoin and runner-up Ethereum, the rest of the business world has focused on what makes those currencies so valuable — especially when it comes to supply chains. The blockchain, a decentralized network approach to verification and authenticity, has far-reaching applications that are still evolving and changing, at times even faster than the speed of business. A blockchain is essentially a collection of complex mathematical calculations to be solved. These equations are difficult enough that a network of optimized, high-powered computers are needed to read and process solutions accurately. The benefit is that multiple "miners" — a term used for cryptocurrency traders that buy and use high-powered computer rigs to solve solutions quickly — are able to work on the same set of problems at the same time, even if they aren't part of the company using the blockchain. At its most basic level, logistics is a series of complex calculations — distance, time, cost and variables all lumped together and chased through best-case scenarios. There are, of course, programs and algorithms that get companies as close as possible to cost-benefit balance, but they're limited at a fundamental level. 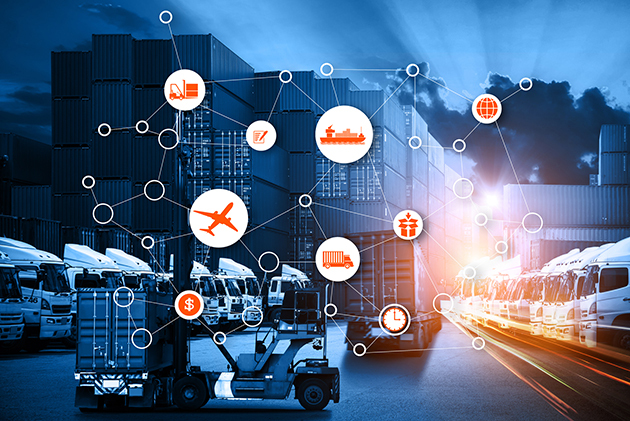 Even a top-of-the-line computer at the warehouse level can only make so many calculations, but the decentralized network of a blockchain approach allows for far more accuracy, ensuring that important processes like stock-level maintenance and lowest-cost/speed methods for outgoing shipments are driven by quality data. In essence, much as fingerprint or eye scanners convert biological measurements into numerical data to use as keys, the blockchain converts decisions into a value that can be examined and verified by a wide variety of other users. The result is "clean" data that has been reviewed multiple times and can be considered actionable straight out of the gate. In those headache-inducing instances when a shipment is misplaced or lost, blockchain-powered transactions help reliably track a package when conventional methods are left wanting. Because the information passes through so many verification checks in the process of blockchain use, it doesn't have a chance to become biased in favor of a service provider or client — data is simply data. That's a level of emotionless decision-making that businesses would have given entire departments to access a scant few years ago, and now the blockchain is making it possible by leveraging the technological investments of an entire network. It's also a smart choice for scalability where SMBs are concerned: Because the benefits are the same regardless of income, it works equally well for businesses large and small. In addition to the isolated blockchain as a tool, savvy logistic-focused businesses also see the potential in cryptocurrency powered by the same process. The so-called "crypto market" is exceptionally volatile at the moment, but when major cryptocurrencies like Bitcoin level off, they'll make purchasing imported goods infinitely easier. With only one monetary conversion (USD to Bitcoin/BTC) to worry about, there will be fewer calculations to factor in when it comes to cost. The blockchain is arguably a more important innovation than any operating system, software or logistics philosophy that will ripple through the industry in coming years. Regardless of industry, size or business goals, it holds the power to balance decisions, provide better long-term results and make your "what if" scenarios infinitely more plausible in theory and actionable in practice. Delany Martinez is a freelance writer with a passion for innovation, particularly in the manufacturing industry and within the supply chain. She's had the privilege of working on several large logistics corporate blogs over the years, and can usually be found with her nose buried in industry trade magazines. Delany believes advances like driverless trucking will revolutionize the supply chain as we know it within a decade, and she is eager to see what the future holds.